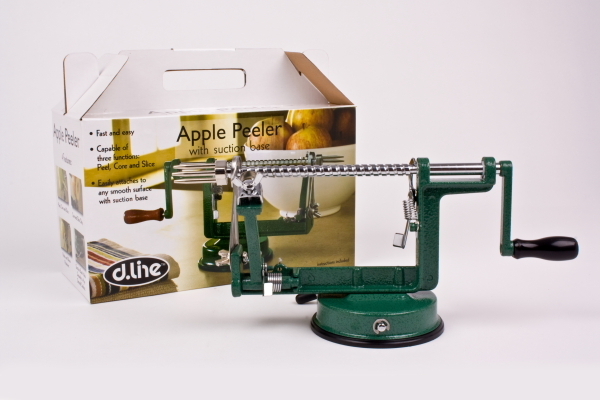 doesn't just peel, core and slice. 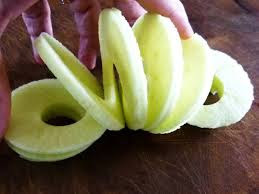 It makes apple slinkies! All of a sudden I think I've become a kitchen gadget person. Part of the plan for this year was to try a bit harder with the cooking. 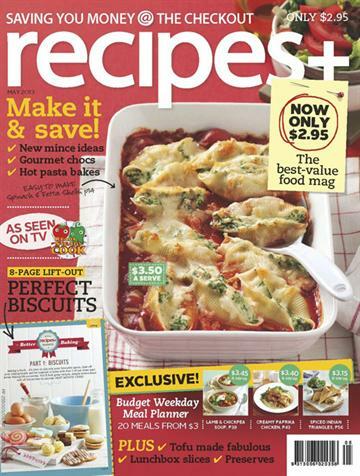 One of the things that helped me was a humble recipe magazine found at the checkout in local supermarkets called Recipe+. There were a few issues during the summer months that were especially helpful in overcoming the cooking inertia. So helpful that in an idle moment just after school had gone back for the year but before my year got too busy, I banged out an email (not even a letter!) to the editor about how helpful those summer editions had been and happened to mentioned (because I am such a clever cook) that the Thai style pork balls were equally delicious when made with chicken mince if pork mince was nowhere to be found and hey presto!- I notched up my next minute in the series of fifteen minutes of fame. My email was published in the May edition. And for my humble efforts I won a prize, which arrived in the mail today. There is an apple peeler (which peels, cores and slices), a lemon squeezer, those scissors (five blade scissors for chopping herbs), a cut and carve board (with an angled surface to collect crumbs and liquids) and a garlic zoom (which is a bit like my beloved happy chopper but garlic clove sized). Apart from my happy chopper, I'm not that much of a gadget person so I'm not sure what I am going to do with all of these things...but it was fun to win a prize and receive a parcel in the mail! I think I must be doing OK on the cooking front because in my mother's day card back in May, one of my boys wrote a spontaneous acrostic poem using the letters of my name and for the "D" said "Does good cooking." And everyone is certainly getting very good at trying new things for dinner in this household. Have yet to make one of these, as per one of my aims for the year. And I have recently discovered that this recipe for cheat's minestrone soup is even nicer without the pasta. It takes things even further away from minestrone authenticity...but given it was already straying from the authentic whose to be worried? And use as much fresh basil as bravery will allow. The more the better. Dried basil not so good. I find the stories of Pakistan, Afghanistan, North Korea and that unlikely convert are still roaming around my mind. Last Sunday I covered the two chapters in Acts about Stephen in Sunday School - how and why he was chosen, that magnificent speech and then his persecution and horrible death. We spent most of the lesson talking about persecution - and what a blessing it is to live here in freedom and safety. I could have illustrated the idea of persecution with anecdotes from Afghanistan or North Korea but in the interests of developmental appropriateness I told the story of how a Chinese couple under threat of persecution prayed the Lord's Prayer instead. These two, they sat together, held hands and prayed the Lord's Prayer in their minds, too scared to even whisper the words in case someone heard them, squeezing one another's hand at the beginning of each new line. That way they knew they were praying the words of the prayer together. And we had a go at it ourselves. But I am always gripped by the last two verses of Stephen's story. While they were stoning him, Stephen prayed, "Lord Jesus, receive my spirit." Then he fell on his knees and cried out, "Lord, do not hold this sin against them." When he had said this, he fell asleep. And Saul was there, giving approval to his death. It is the mark of a life of deeply faithful, prayerful, loving devotion to God that one faces a violent death by praying for the perpetrators of the awful crime. I find myself continuing to think about how it isn't ours to decide upon the extent of the reach of the gospel. Stephen didn't. He prayed that God would forgive those who were so angrily and awfully ending his life. He was praying for their salvation. And then there is Saul, standing there, giving his approval to Stephen's death. No-one would dare go near Saul with the good news of eternal salvation through Jesus Christ for fear of similar treatment. And yet, Saul's world was turned upside down soon after and then he proceeded to turn the gentile world upside down with the good news of Jesus. These verses take my breath away. They encourage me to keep digging where the ground is hard. And to keep praying for those doing hard yards in hard places. It's not our decision. And with God, all things are possible. 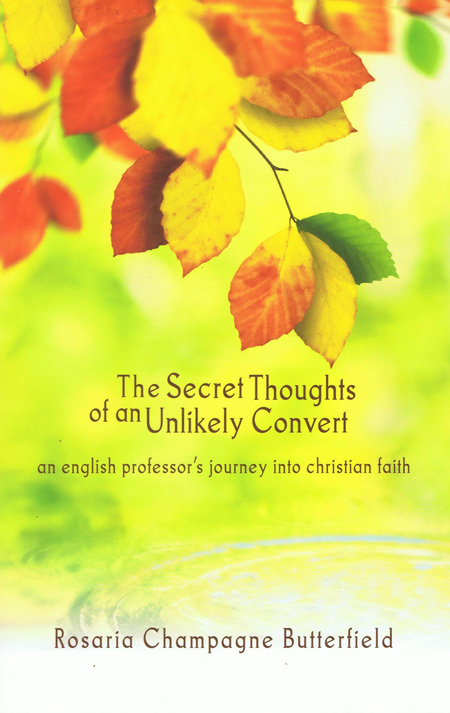 The Secret Thoughts of an Unlikely Convert: An English Professor's Journey into Christian Faith by Rosaria Champagne Butterfield has been doing the rounds of the blogs for a while. It found its way onto my pile of books to read late last year but I have just got to reading it very recently. Written by an English professor it is, as you would expect, beautifully crafted. It's an autobiography - Rosaria Champagne Butterfield's journey from successful English literature professor at Syracuse University specialising in Queer Theory and committed lesbian to a pastor’s wife who now spends her days teaching not university students in lecture theatres but her adopted children around her own kitchen table. I have read quite a few reviews on this book - I was interested to see what other people thought. There are many positive reviews out there on this one and interestingly, each one picks up on something different. This books meets different people in different places. Three things struck a chord for me - all from the first half the book. The first is the lesson that it is not up to us to decide how far we think the gospel can reach. The gospel can makes it way into all sorts of tiny nooks and crannies that we would never have imagined to be within its reach. It's just not our job to decide who we think will respond to the gospel and who we might consider to be a lost cause. I felt rebuked for times of being judgmental. The second is that sharing the gospel is not about shiny programmes and polished performances. In this case it was through quiet conversations around the dinner table over many, many months of calm, kind, patient hospitality, slowly answering questions and never forcing the issue or pushing for a result. I felt rebuked for my impatience. But it is the third that most captivated me. There are many victorious stories of conversion to Christianity out there, where the new convert is full of joy and zeal and energy. And it is a great and wonderful thing to be brought into a saving knowledge of the Lord Jesus Christ, so don't get me wrong. But my own conversion was not like that. The day I became a Christian I went from being the consummate goody-goody to discovering that my life was full of sin. The day I became a Christian marked the beginning of six weeks of being more depressed than I've ever been in my whole life as I came to realise how much of a goody-goody I wasn't and twelve months of utter exhaustion as I set about rethinking every thought and opinion I held to make sure it lined up with what I newly believed. I remember crying for someone when I heard they too had become a Christian, knowing that they were now heading into a hard time of re-evaluating everything and appreciating their own sinfulness. Becoming a Christian turned my whole world upside down. Now I am glad for it - for having my world turned upside down and for the things I learned during that time - but at the time it did not seem an easy start. I don't want to celebrate her pain. But I was glad to read her honest account. I suspect that this experience of having one's world turned upside down is more common than our cheery books or blogs would have us believe. Life is messier than that. This is good, honest writing. I didn't agree with everything she had to say - that seems to be a common thread in the reviews I've read as well - and so perhaps that needs to be said by way of warning when sharing this book with others, but none the less, it's a worthwhile, instructive and encouraging read. Today I am praying that I will deeply and truly know and trust that my life for all eternity is arranged and secured by God in every part and that my every desire will line up with His desires and not be driven by my own selfish heart. Worked out that my Bible reading plan goes through the Old Testament, Proverbs and the New Testament once but through the Psalms twice in the year. I became suspicious when I started in on Psalm 119 recently and it was only May... But I am more than happy to read through the Psalms twice in a year. Loving reading Psalm 119 bit by bit. 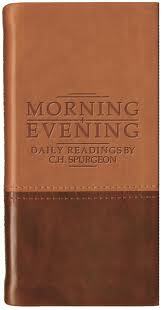 It is wonderful to read it as a whole - so don't be frightened of its 176 verses. Yes, it lacks the compactness of Psalm 117 but did you know you can read the whole of Psalm 119 out aloud in less than 15 minutes - it's a fine thing to do in a group. For now I am enjoying reading it at the rate of eight verses a day and dwelling on all the goodness to be found there in. And it is lovely. How are these words from the morning reading on 21st May? "Do not rest, O believer, till thou hast a full assurance of thine interest in Jesus. Let nothing satisfy thee till, by the infallible witness of the Holy Spirit bearing witness with thy spirit, thou art certified that thou art a child of God. 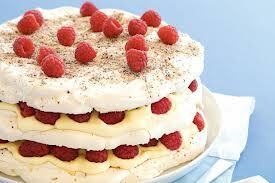 Oh, trifle not here; let no 'perhaps' and 'peradventure' and 'if' and 'maybe' satisfy thy soul. Build on eternal verities, and verily build upon them." "Build upon eternal verities and verily build upon them." How good is that? Speaking of being slow on the uptake when it comes to auctioning Christmas presents, determined that June will be the month in which I season the new wok I got last Christmas. But I think I have decided that I won't worry about a slow cooker. Also reading Tim Chester's Unreached: Growing Churches in Working Class and Deprived Areas. Good reading. Have four books sitting and waiting to be read after I have finished the Tim Chester book. But life is going to get busy for a while so it may be time to relax with another Jane Austen novel. Mansfield Park is next in the line up. Enjoying remembering and talking about the fantastic holiday we took over the end of April and beginning of May. That's why I wasn't strictly in situ for last month's status report. Can you guess where we went? Delighted that Wendy has joined me in monthly status reports over at her blog Musings. 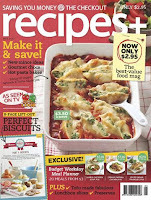 Wendy does excellent book reviews as well and there is a veritable treasure trove of helpful reviews to be found there. And I am loving the contributions to the Prompted to Write posts as well. It is a joy to read how a few of us handle the one topic. Writing and receiving letters in the mail. It happens in short bursts and it's lovely when it does. Feeling as though the blogging muse has left me somewhat. I have about ten posts in various states of draft and none seem to be quite getting over the line at the moment. I'm sure the blogging muse will return, but I am enjoying the company of the letter writing muse in the meantime. Thankful to God for words and His Word. Thankful for being able to read, write and communicate in words. I think often about this quote from Jon Bloom writing at the Desiring God blog.